mani’s bakery on fairfax is a must-visit for all vegans, as far as i’m concerned. i ran across mani’s awhile back when the bakery made an insane vegan cake for my co-worker’s birthday. i went to mani’s later to check it out and realized that their vegan menu was huge compared to other restaurants in town. i mean, they even have a full-on legend at the top of the menu for vegan and vegan-optional items. on top of that, the food is pretty damn good and they have great hours, plus they serve breakfast all day long. yay mani’s bakery! my husband and i hit up mani’s recently and were pretty impressed with the food. 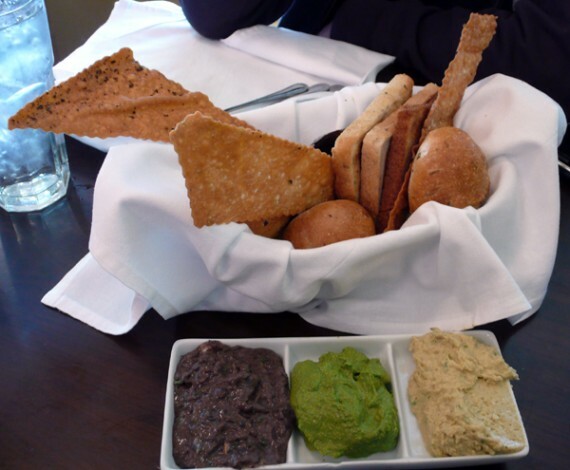 one of the vegan-optional starters at mani’s is the bread basket. being a self-contained bakery and all, mani’s definitely has the bread thing down. our basket included an impressive selection of piping hot crunchy slices, soft and chewy rolls, and thin and crispy chips. the spreads were black bean, pesto, and hummus; and each one was rich, flavorful and creamy. between me and my husband, the bread basket was way too much food to finish, but that didn’t stop us from trying. as a main, my husband ordered the vegan-optional arugula artichoke salad. while 14 bucks is definitely a lot to pay for a salad, this thing was pretty huge and they didn’t skimp on the tempeh. the artichoke hearts were shredded into delicate slices and marinated perfectly. the braised tempeh was amazing; why anyone would get this salad with the grilled chicken option is beyond me! 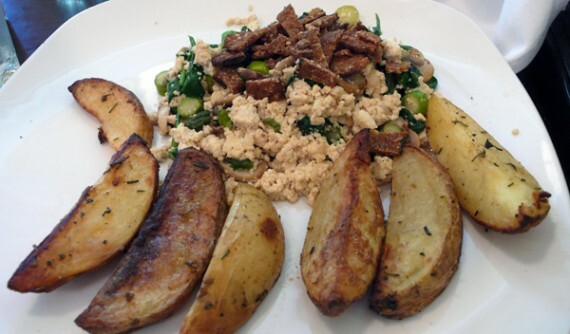 i took advantage of the fact all day breakfast and went for the tofu scramble hash. it was insanely delicious. the tofu was scrambled up in big thick chunks and was all mixed in in with the vegetables. 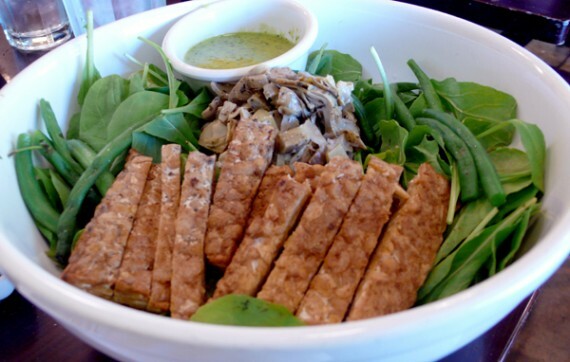 the soft mushrooms, spinach and tofu went perfectly with the crispy, crunchy asparagus. i got the vegan option, which came with sliced tempeh rather than veggie bacon, and it was quite tasty. the breakfast potatoes were top notch as well. good stuff all the way around. while the food is awesome at mani’s, it’s often crowded and dining in can be unpleasant. you will probably have to wait for a table, the restaurant is loud and cramped, and the chairs aren’t that comfortable. for the high prices, i would expect more of a dining experience rather than the quickie cafe feel that mani’s offers. fortunately for me, the food is just as delicious to go. on a subsequent visit, my husband and i grabbed take-out from mani’s for dinner, and mine was every bit as tasty. i ordered breakfast again, but this time i got the wrap. 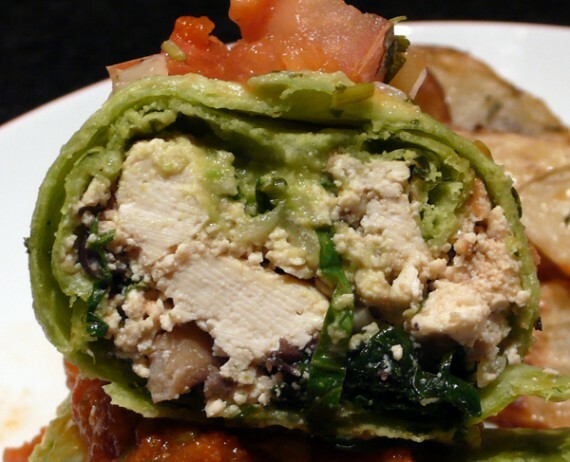 the breakfast wrap is super because it’s pretty much the exact same tofu scramble as above, but it’s thrown in a tortilla with beans and guacamole. plus, it’s 3 bucks cheaper. score! 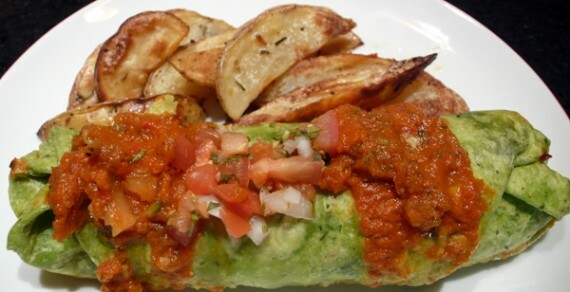 tasty scramble, all rolled up. this time my husband ordered the classic sandwich, veganized with kale greens. it was good, but not as good as the salad he’d had in the restaurant. i took a bite of the sandwich and thought the seitan was delicious, but my husband described it as “too chewy” and “glue-y.” maybe next time i will order it for meself! so overall, mani’s bakery is definitely worth a visit. whether you dine in or take-out, the food will most likely be delicious. they have a massive menu with loads of vegan options, just remember to specify. plus, they have a whole freakin’ bakery with fresh bread and vegan desserts! cakes, cookies, even almond roca…they’ve got TONS of stuff to choose from. i’ve just always filled up on the tasty food, leaving no room for their tempting sweets. thankfully, there’s always next time! I had heard about Mani’s & have even driven past, but the bakery menu looks super healthy-style, so I didn’t think much of it. Good to hear it’s tasty! melisser: dude, the stuff at mani’s sure doesn’t taste healthy! and all those CAKES. oy!